One of my relatives is hearing-impaired. She doesn’t read lips or use sign language, but we always want to include her in our conversations and our lives. We write frequent emails, and when we call, she uses a Captel captioned phone — which works wonderfully since it prints the conversation. Then she can read it and respond. 1) Use an erasable whiteboard to write the subject of the conversation. Once she knows we’re talking about hogs, dogs or logs, for example, the rest of the conversation is easier. 2) Minimize the number of words said — stick with the subject and verb and use as few elaborating words as possible. The goal is to get the main point across. If it’s not working, rephrase using different words to express the same thought. 3) Use a smartphone as a portable captioning device. Just turn on Siri (or similar voice activation software), speak, and the words appear on the screen — where she can easily read them. This is an incredibly useful tip we just learned! 4) Use sign language. The gestures, along with the words, usually clarify the message. 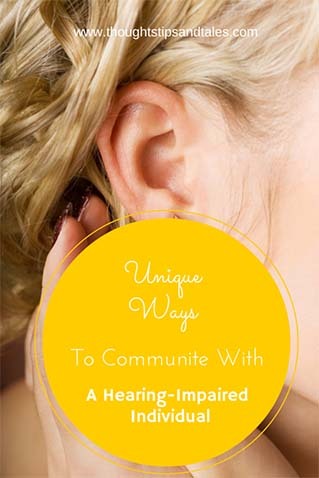 Do you have any tips to communicate with hearing impaired friends and family members? This entry was posted in communicate with hearing-impaired individuals, communicating with hearing-iimpaired people, hearing impaired, tips for communicating with hearing-impaired people and tagged communicating with hearing-impaired individuals, communicating with hearing-impaired people, hearing-impaired people, techniques to communicate with hearing impaired, tips for communicating with hearing-impaired people. Bookmark the permalink. What a great use for Siri! I would have never thought of that. Just read that in Bottom Line magazine and thought it was brilliant!